Lipscombe, Nick. 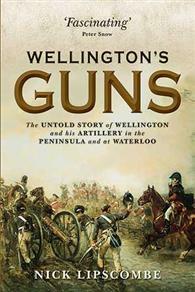 Wellington’s Guns: the Untold Story of Wellington and his Artillery in the Peninsula and at Waterloo. Botley, UK: Osprey, 2013. 456 pages. ISBN# 978178061149. Hardcover. $30/£25. When the British Army landed at Mondego Bay, Portugal in August 1808 to force the French out of the country, the Royal Artillery contingent that accompanied it had 18 artillery pieces divided among two batteries and about 2500 rounds of ammunition. The Royal Artillery came extremely ill-prepared. Considering the size of the British force it was supporting, the problem with the artillery was not the number of guns, but the lack of horses to move them. Additionally its supporting staff consisted of only two officers. Compared to what a French Infantry Corps had in the way of artillery support, British Artillery looked amateurish. By the end of Peninsular War in 1814, the British artillery was a force to be reckoned with. Wellington’s artillery 12 Royal Artillery Companies, 6 Royal Horse Artillery Troops (including one equipped with rockets), and three Portuguese artillery batteries. Wellington could field 91 artillery pieces, plus a rocket troop. In addition to these forces, the artillery had another four companies that were responsible for ammunition supply. As importantly, the artillery had a fully functional staff to coordinate all these assets. During the Waterloo Campaign, the British artillery was even stronger, with 10 troops of horse artillery and 10 companies of foot artillery. The artillery had 119 guns and 13 rocket sections. It was also supported by an experienced staff. This evolution from an organization that could not support itself to a professional one that could challenge the might of a French army commanded by Napoleon, was not painless, and it would prove quite costly for many careers. Wellington’s Guns is not a technical book. If you are looking for data the capabilities of different artillery pieces, how they were limbered or moved into action, this is not the book for you. It is about relationships – between the artillery officers and the Duke of Wellington as he molded the artillery into the force he needed to support his army. It was not a pretty process. Wellington was frustrated throughout much of the Peninsular War because of what he considered to be poor performance by the Commander of the Royal Artillery (CRA) who was the senior British artillery officer in the army. Eight different officers served as his CRA, none to his satisfaction until he finally was able to get the man he wanted, Alexander Dickson, appointed to the position, in 1813. Dickson was a Royal Artillery captain who was seconded to the Portuguese Army. In 1812 he received a brevet promotion to lieutenant colonel in the British Army, which also permitted him to be promoted to colonel in the Portuguese Army. Until that point, there were 12 artillery officers in the Peninsular Army who were senior to him. Wellington used Dickson’s Portuguese rank to justify selecting him to be the CRA, which was a major general’s position! Much of Wellington’s Guns explores Wellington’s relationship with his CRA. A constant theme throughout the book was that the artillery officers felt they rarely received any recognition for their accomplishments, while Wellington would counter that their accomplishments were usually tarnished by their failures, not necessary in battle, but as commanders. This constant friction impacted on how they viewed each other. When I first read the premise for Wellington’s Guns and saw that Colonel Nick Lipscombe is a retired British artillery officer, my first thought was that he would write it with a built in bias that would support his fellow artillery officers and would cast Wellington as the villain. I was pleased to find that he provided a balance view and was willing to blame the artillery officers for creating their own problems as he was to blame Wellington. Two cases in point. . . towards the end of the battle of Vitoria in 1813, Wellington placed Captain Norman Ramsey under arrest for not obeying his orders. He was relieved of his command and it would be several days before he was re-instated. Colonel Lipscombe examines all the evidence and concludes that “Under the circumstances, Wellington’s initial reaction was explicable but, once he recovered from his fit of pique and the full circumstances becomes known, he should have rescinded his instruction. . .” Yet the author is not so supportive of the artillery officers with their complaint of not receiving recognition for their prodigious performance at Waterloo. He lays out all the arguments why Wellington did not give them the official recognition and why some were justified and others were not. Colonel Lipscombe took a unique approach when writing Wellington’s Guns. The book is chronological, starting with the arrival of the British Army in Portugal in 1808 and ends with the Waterloo Campaign of 1815. Each chapter covers one campaign or battle and much of it is told through the eyes of one of the artillery officers who had an impact on that battle. He draws heavily on primary sources to provide insights on what the officer was thinking at the time and why he took the actions that he did. Although this method is not really new, the author had access to the James Clavell Library and Archives of the Firepower Royal Artillery Musuem at Woolwich. It turns out artillery officers of the period were quite literate and Wellington’s Guns contains many passages from letters and memoirs of notable officers as Robert Bull, George Cookson, Samuel Bolton, Richard Hardinge, Robert Gardiner, Robert Gardiner, Robert Lawson, Norman Ramsay, and William Robe. And of course he also used published letters and diaries, such as Alexander Dickson, Hew Ross, Alexander Mercer, Augustus Frazier, and Benjamin Miller. Each chapter is also named for the artillery officer who is the focus of that chapter. For example, the chapter on the battle of Coruna is titled “Cookson’s Powder Keg” and the deliberate explosion of 12,000 barrels of gunpowder to keep it from falling into French hands. Colonel Lipscombe also looks at some of the myths that concerned the artillery that grew out of the Peninsular War. These include whether Wellington ever loss a gun in the war and Norman Ramsey’s epic escape from the French cavalry at Fuentes d'Oñoro. Throughout the book, the author provides charts showing the state of the artillery at the time, to include the army artillery staff, the names of the companies or troops, their commanders or acting commanders, where they werelocated, which division or unit they were attached to, and the type of artillery pieces each had. He also includes the various companies that were either providing logistical support and thus had no guns, plus those in different garrisons. There are 33 of these charts, so the reader can easily track the expansion and organization of the artillery under Wellington between 1808 and 1815. Wellington’s Guns closes with four appendices. The first is a list, by company and troop, of every officer who served in that unit in the Peninsula and the period they served there. For many of the officers, he includes notes about them. . . who they were, whether they were killed or wounded, etc. The second appendix does the same for the Waterloo Campaign. A nice touch of these two appendices, he also notes whether the officer left behind eyewitness accounts, diaries or memoirs that were used in the writing of Wellington’s Guns. Some of the troops and companies had two or three sets of memoirs written about it! Appendix Three lists those officers who earned the Army Gold Cross or Gold Medal for meritorious service in the Peninsula, plus those who were still alive in 1847 and received the Military General Service Medal. The final appendix, lists the artillery allocation of several sieges, including the 2nd and 3rd Sieges of Badajoz, Ciudad Rodrigo, Tarragona, and the 1st and 2nd Siege of San Sebastian. There is information on each battery and the guns that were assigned to it on each date of the siege. Wellington’s Guns is a fascinating book. The author has blended a superb narrative that will hold the attention of the casual reader with enough detail to satisfy those who are looking for previously unavailable information on the composition of the artillery and, as importantly, its supporting staff. I highly recommend this book for everyone. It will appeal to both the ardent Napoleonic scholar and to those looking for a quick and exciting read. Neither will be disappointed! As a collector of British memoirs, being able to read these excerpts from these previously unavailable sources was worth the price of the book in itself!